This article originally ran in the June 2009 issue of JCK Magazine. Even if you’re not on Facebook, chances are you know someone who is. You may even know someone who, in spite of themselves, got sucked in and is now an addict. The site has become an Internet phenomenon, growing at an astronomical rate, with over 5 million people joining each week. And while it was originally meant for college students, its 175 million active users now include grandmothers, celebrities, and a growing number of jewelry companies—including big names like Zale and Tiffany. The “Facebook Jewelers’ Group” and JCK fan pages each have more than 250 members. 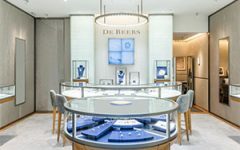 The number of independent jewelers on Facebook is small, and many that are active also use other forms of online communication, like blogs and Twitter, the other fast-growing social networking site. Yet there is a growing awareness among jewelers that Facebook can be a boon for business. If the best advertising is word of mouth, Facebook can be looked at as one big referral. Facebook can also connect you with people from your past—old friends from school or camp or people you’ve simply lost touch with. All are potential customers. Gordon agrees: “The people who become a fan of me and my blog become crusaders for my store. As opposed to just an eyeball looking at a Doritos commercial.” Lee Krombholz, owner of Krombholz Jewelers in Cincinnati, uses his page to post new store videos and to promote the parties his store throws on the first Friday of the month. “It’s a way of enhancing your connection with people,” he says. * Keep your tone light. Even though Facebook can promote jewelry, most people are on it for fun and don’t want to be drowning in sales pitches. * Let people know your page exists. As with an e-mail list, people won’t know your Facebook page is there if you don’t tell them. Sometimes customers who don’t want to be overwhelmed with e-mail are more receptive to adding you as a Facebook friend. And, since Facebook is so hot, it stamps you as a forward-thinking jeweler. Dan Gordon, of Samuel Gordon Jewelers, recently took his wife to Las Vegas for a weekend getaway. Normally that kind of trip would be perfect for a Facebook update. But because he’s a jeweler, he decided not to write anything about it. That was the right thing to do, says John Kennedy, president of Jewelers’ Security Alliance. “You can use Facebook for promotional purposes, but you don’t want to give out too much information,” he warns. Kennedy says jewelers should be careful about letting people know too much about their location, their family, or where they live. (Facebook does not ask for home addresses.) “I know that you have to promote yourself, but you have to draw the line at things that are too personal,” he says. Ron Samuelson, Samuelson’s Jewelers, Baltimore, M.D.